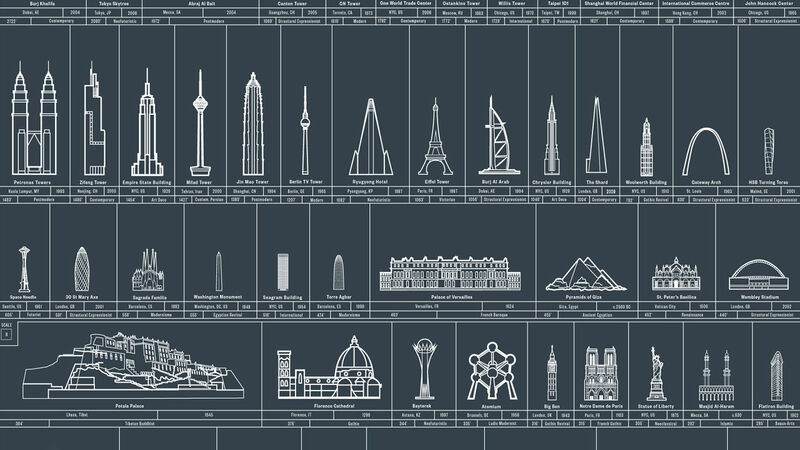 Pop Chart Lab’s latest infographic charts the most significant works of architecture since 4,800 B.C. Yet another creation has rolled off the powerhouse infographics assembly line over at Pop Chart Lab, and this time, the indefatigable taxonomizers of alcohols and famous quotes have turned their attention to works of architecture. The Schematic of Structures organizes what the designers describe as “90 eminent edifices erected and perfected throughout history.” Arranged by height, the infographic lines up some of the greatest works envisioned and built by man since prehistory, from the Neolithic Cairn of Barnenez and the Parthenon to more modern creations like London’s Gherkin and the Burj Khalifa. The White House even makes an appearance. Designed in imitation of a blueprint, the infographic is expansive in scope and information (if not extraordinarily innovative in execution). The buildings are presented along a simple grid design, and drawn in two different scales (so as to allow the 2,722-foot-tall Burj Khalifa to appear on the same poster as the 25-foot-tall Stonehenge). Along with an illustration of each structure, the poster includes the location and approximate date of construction, as well as its primary architectural style. Pre-order the poster here for $23. 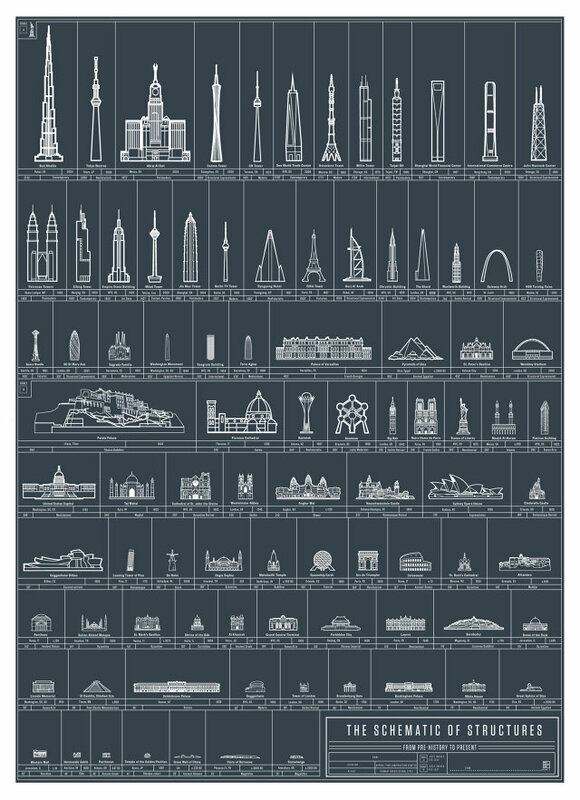 Source: Shaunacy Ferro, Mankind’s Greatest Architectural Achievements Since Prehistory, Co.Design, Fast Company, September 24, 2014, http://www.fastcodesign.com/3036227/infographic-of-the-day/mankinds-greatest-architectural-achievements-since-prehistory?utm_source=mailchimp&utm_medium=email&utm_campaign=codesign-daily&position=1&partner=newsletter.